An Apple patent filing published on Thursday suggests future iPhones and iPads might sport force-sensing Touch ID home buttons that rely on technology similar to iPhone 6s' 3D Touch system. 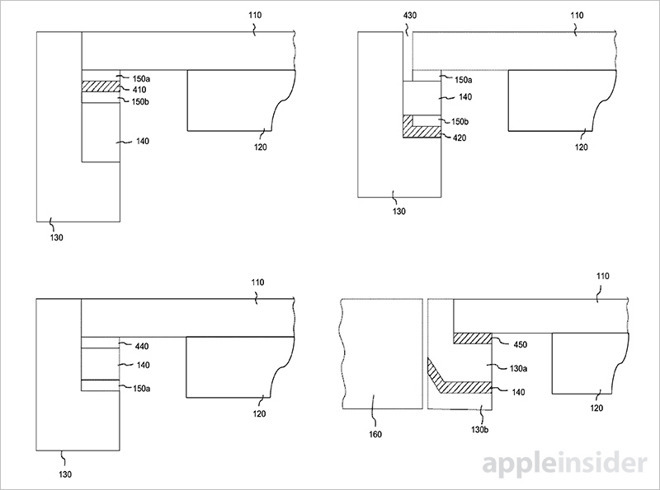 Published by the U.S. Patent and Trademark Office, Apple's "Force-sensitive fingerprint sensing input" filing describes in detail the mechanisms and potential use cases of integrating a force sensing apparatus with a biometric security device, respectively 3D touch and Touch ID in Apple parlance. Current Touch ID modules found on iPhone and iPad already serve dual purposes as highly accurate fingerprint sensors and iOS system home buttons. Covered by a thin sapphire wafer, Touch ID guts are nestled in a capacitive sensing ring that, when touched, facilitates a scan operation. 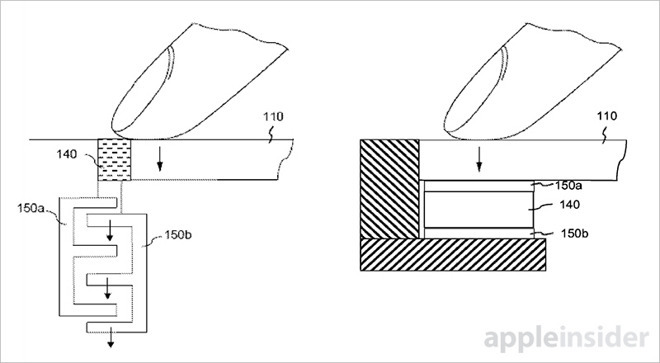 Apple's invention proposes the installation of a mutual capacitance sensor in the architecture directly below a Touch ID fingerprint sensor. In such arrangements the capacitance between two electrodes can be measured to ascertain distance, which is then be translated to applied force and reflected appropriately via a graphical user interface. For example, as a user presses down on a Touch ID button, the mechanism compresses, bringing two sandwiched electrodes closer together, thereby increasing capacitance as a function of force. The invention provides for a resistive element, such as an elastomeric material, spring or similar component, to resist depression of the button. This structure might also serve in the placement of capacitive electrodes. As seen in the image below, electrode stack-ups may be widely varied, though Apple makes specific note of certain groupings including mutual and self capacitance with elastomer, active button trim, functional plates, directional force sensors and more. The solutions described are very similar to the 3D Touch system deployed in iPhone 6s and 6s Plus handsets. Unlike Apple Watch's Force Touch mechanism, which relies on distinct electrodes embedded around the periphery of a display, 3D Touch incorporates a panel of capacitive sensors integrated with iPhone's Retina HD display backlight. With 3D Touch the distance between electrodes embedded in the flexible cover glass and those in the capacitive sensor panel are measured. This data combines with signals from the multitouch screen and onboard accelerometer to inform highly granular, localized force input. As applied to common Touch ID hardware, force-sensing technology allows for a comparatively diverse and rich user experience. For example, an iPhone can be unlocked by a light touch with a registered finger, while a deep press unlocks the device and executes an operation like opening an app. Contextual commands might also be mapped to distinct pressure levels, such as replying to a recently received message with a selection of intelligent responses. In the latter scenario, varying thumb pressure alone would provide sufficient input information to view a message, browse a list of preset text and select a tailored reply. 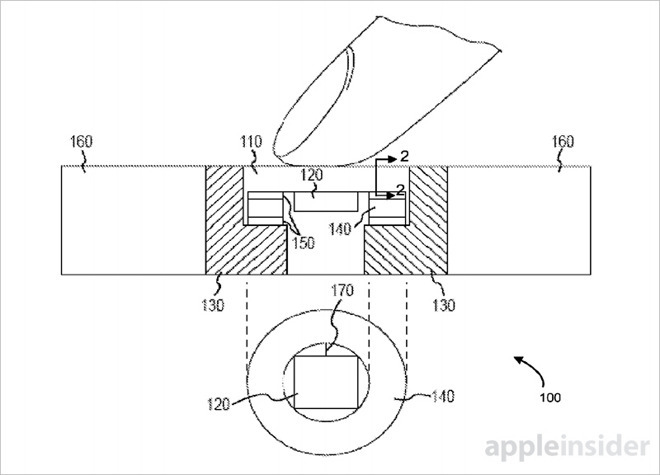 Apple's plans for today's force-sensitive Touch ID invention are unknown. What is clear, however, is Apple's intention to distribute force sensing technologies across its many product lines, a process well underway with Force Touch for Apple Watch and MacBook and 3D Touch for iPhone. Apple's force-sensing Touch ID patent application was first filed for in 2013 and credits Benjamin B. Lyon, Dale Setlak, Michael B. Wittenberg and Shin John Choi as its inventors.